“As the only female lawyer in Bombay, you hold a power that nobody else has,” a British government official tells Perveen Mistry in this first of a refreshingly original mystery series – and he’s right. It’s 1921, and Perveen is a solicitor in her father’s law firm. Even though she can’t appear in court, her position and gender mean she’s the only individual with the means to look into a potential instance of deception and fraud. A Muslim mill-owner's three widows, who live in purdah with their children in his mansion on Malabar Hill, appear to have given away their rightful dower and inheritance. Perveen suspects they didn’t realize the implications of their signature, and when she visits the three individually, it appears that she’s correct. When she discovers a body on her return visit to the Farid family, she suspects a member of the household did it – but who? There’s considerably more to the plot than a traditional murder mystery, though. Though only 23, Perveen has a professional, mature demeanor that helps her gain the widows’ confidence, and there’s a reason behind it: she’s been through a lot in her short life. Massey depicts her backstory in chapters set back in 1916. This allows for two stories running in parallel: who committed the crime at Malabar Hill, and what trauma did Perveen endure? While I was struck by the abrupt jump back in time initially, I came to feel that this increased the suspense. The setting for this story is absolutely key, and from the Mistry residence on the city’s outskirts to the prestigious Taj Mahal Hotel along the harborfront, the layout of historical Bombay is described in clear, thorough fashion (the maps at the beginning are helpful but not absolutely necessary). Perveen and her family are Parsis – descendants of immigrants from Iran – and followers of Zoroastrianism, and the novel explores the religion’s traditional and more orthodox beliefs. Bombay contains a multiplicity of cultures, classes, and languages, and I came to admire Perveen’s ability to steer a fine path through it all. What comes through most strongly in this entertaining work, though, is the status of women, and how much Perveen had to accomplish to get where she is. The Widows of Malabar Hill also makes you think about how critical the support of family and others can be for women in desperation; where would the novel's characters have been without it? 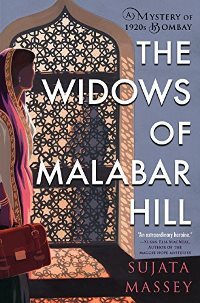 The Widows of Malabar Hill is published on January 9th by Soho Press; I read it from an ARC received at BookExpo last year. It's interesting how i read a review of this book on another blog although the other blogger didn't mention this was a series. The good part of this story seems to be the fact that its not all about murder and it brings a perspective unique to those unfamiliar with Indian culture. Yes, both of those are true. I enjoy historical mysteries, but it was also a highlight to have a window into women's lives and the cultures of 1920s Bombay. The author mentions more about the 2nd book in the series in a Q&A on her website (toward the end). I'll be in line to read it.